Common software testing types such as regression testing, functional testing, unit testing, integration testing, etc., are being replaced with systematic testing programs using automation tools. Today, Test Automation is being considered as the most effective way to enhance coverage, efficiency and effectiveness of any software application. It is redefining the way the engineers perform testing operations. Having said that, the toughest task for any project is to decide whether Test Automation is required or not. If yes, then what apparatus (tools & procedures) should be utilized. This altogether lays down the grounds for Automation to be considered as an alternate skill set by and large. The IT market is brimming with automation tools, but not every tool suits your project prerequisites. One may need to closely examine the project specifics to choose the most appropriate tool. However, to analyze and zero-in to one tool that best fits a specific need is a big challenge. While working on a specific project, a team at Saviant faced challenges with their existing test automation tool and had to find the one that best suited their needs. In order to do so, they formulated a strategic approach to choose the right automation tool. 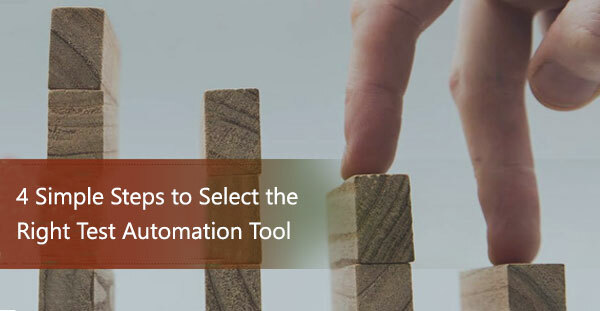 Let’s take a walk through their simple yet efficient approach to select the right automation tool for a project. Maintaining the quality of an application by delivering a bug-free product is crucial for the success of any project. Automated testing can help improve the quality of a project and increase scope & depth of the tests. For this, get a deep understanding of your project requirements such as project type (web/desktop/mobile), scope of the project, and existing team’s strength on code language before you start the process. There is no such tool that is good or bad but the ROI of any tool relies on the need, i.e. what precisely does one need to automate and what amount of test cases needs automation? In our case, after thorough analysis of the project requirements by the consulting team, it was determined that both manual & automation testing will be a mandate to test the web, mobile and desktop application. Hence, they needed a tool that integrates seamlessly with their project planning & test management tools, and is easy to learn & simple to use. Our team considered Selenium Test Automation Tool as a benchmark to evaluate and determine the best automation tool for their project. The advantages and drawbacks of Selenium Web Driver framework need to be understood before evaluating other tools. There are many key points one should consider before deciding the best-fit automation tool for a project. Here is the list of few key criteria that was used to evaluate the best tool in our case. Ease of Developing and Maintaining the Scripts: Development & maintenance of test scripts should be as simple as possible to decrease the human and time resource utilization. Ease of Test Execution for Non-Technical user: The test suite execution should be simple for any project member to run them easily as and when required. Also, it should be easy for manual testers who have very little or no technical knowledge. Support to Web, Desktop & Mobile application: Leveraging 3 different tools for 3 types of platforms for test automation is a complicated task to handle. It is better to select a tool that supports all the three platforms. Intuitive Test Report: Test reports build confidence and so the reports need to be intuitive and simple for the management team to understand easily. Cross Browser Testing: Support to Cross browser testing is a must when there are multiple end-users and no particular browser restriction. Support to Keyword & Data Driven Testing: Keyword driven testing acts as an extension to the data driven testing framework. When a project becomes complex, test framework needs to be extended. Technical Support and Assistance: Automation Engineers definitely need help while handling critical problems of a project. The tool that provides technical support and assistance would be of great help. Language Support like C#, Java, Python and others: Every test scenario cannot be recorded. In some cases, the tester must write the code. So, the tool that supports the required language to write the customized scripts would be helpful. TFS DevOps integration with builds: Support to integrate with Continuous Integration tools for automated builds and deployments is necessary. Pricing: Depending on the above qualities and project cost estimates, evaluate the cost difference among the other available automation tools. Using few of the above key criteria as vital parameters, our team leveraged Pugh Matrix technique to choose the best tool for mid-scale web, desktop and mobile test automation. The below Pugh matrix demonstrates the pros and cons of various tools, such as Ranorex, Test Complete, Ghost Inspector, and Test Studio, keeping Selenium Web Driver as the benchmark. For the first parameter, i.e., ease of developing and maintaining the scripts, Selenium is considered as good (S) and we rated Ranorex, Test Complete, and Test Studio as better (+) than Selenium and Ghost Inspector as rated as worse (-). This shows that Ranorex, Test Complete, and Test Studio tools offers similar experience to develop & maintain scripts. Similarly, the team has rated all the other criteria to arrive to a conclusion. This grid has been devised on the basis of research and experience gained by working on the tools. In the matrix, Ranorex wins the race over Selenium, Test Complete, Test Studio, and Ghost Inspector. Ranorex is an intense and efficient tool for automation of web, desktop and mobile application. It provides exceptionally basic, simple to utilize UI and record & play back elements. The tool uses screen scraping technology which is independent of the Application Under Test (AUT) running on the screen. Apart from the technical plus points, Ranorex offers good customer support through online forums and via email. With expertise gained through minor trainings or self-learning, even a manual tester can build framework leveraging this tool. Few of the giant companies that use Ranorex include Siemens, Motorola, Ericson and Vodafone. Each tool is a good player on its own ground. This analysis is not on account of the tool being unfit but rather in light of the fact that Selenium Web Driver needs more skillful resources for coding. This surpasses the cost of any other tool in terms of Pricing and ease of complexity of maintenance. However, Selenium Web Driver is the most effective tool for extensive scale web applications. Ghost Inspector is best suited for small user interface automation, whereas Test Studio is good for desktop and Web application testing. Test Complete is similarly capable as Ranorex but its cost and updates are much costlier than that of Ranorex.